There is a lot about Tim Burton’s Alice in Wonderland that’s curiouser and curiouser, but just not much “muchness.” It is a phantasmagorical fever-dream that is both absorbing and banal, a looking glass that reflects Narnia, Middle-earth, and assorted other child-escapist imaginaria while refracting its source text. The seemingly sensible argument that Lewis Carroll’s 1865 novella Alice’s Adventures in Wonderland predates The Chronicles of Narnia, Lord of the Rings, and similar fare is undercut by Linda Woolverton’s updated screenplay, a mash-up of Alice’s Adventures with Carroll’s Through the Looking-Glass and the creatures inhabiting his nonsense poem “Japperwocky.” Although these narrative liberties may repulse English majors and Carroll purists, they do allow Burton the freedom to emboss the story with his own unique vision. What the director does with this license, however, is a conundrum worthy of a Mad Hatter riddle. Ten years after her first trip to “Underland” – which she does not remember – a now 19-year-old Alice (Mia Wasikowska) finds herself at a personal crossroads. Following the death of her beloved father, Alice is due to become betrothed to a man she does not love in front a throng of family and friends at a Victorian estate party. Problem is, Alice keeps wilting under the pressure and spying a strange white rabbit wearing a waistcoat and a pocket watch which, at the moment of her matrimonial truth, she chases, again, down the rabbit hole. 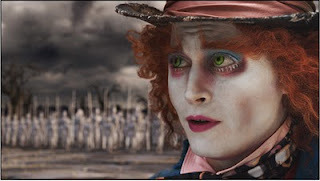 There, Alice encounters a host of familiar characters: the aforementioned White Rabbit (voice by Michael Sheen); the chain-smoking Blue Caterpillar (Alan Rickman); the Cheshire Cat (Stephen Fry); Tweedledee and Tweedledum; and, of course, the tangerine-hued Hatter, played to Burtonesque delirium by Johnny Depp. Seems only Alice can save Underland from the clutches of the cruel, bulbous-headed Iracebeth the Red Queen (Helena Bonham Carter) by slaying the Japperwock and restoring Iracebeth’s younger sister – the kindly, pacifist White Queen (Anne Hathaway) – to the throne. Burton has always embodied the sentiment behind Alice’s query, “What is the use of a book, without pictures or conversations?” There is wonder in the film’s unrelenting visuals, comic spark, and intriguing voice works – particularly impressive is the trippy cool of Rickman and Fry, while Christopher Lee is instantly recognizable as the Japperwock’s resonant baritone. But, it is a sense of awe not shared by the surprisingly aplomb Alice. Burton’s 3D pictorial of a young girl’s arrested development and reluctant embrace of womanhood belies the fact that Alice’s entire time underground is spent having one creature after another tell her where to go and what to do. Her path seems remarkably inevitable, yet somehow the Alice that crawls out of the rabbit hole now is a budding feminist with aims of carrying on the family business and blazing trade routes to China. The pleasingly zany spectacle of it all comes at the expense of the story’s soul. Beyond their collective lunacy – “We’re all mad here,” the Cheshire Cat famously informs – we barely ascertain any character motivation. The audience cranes its neck to hear a lone, brief exchange between the regal sisters, hoping for some nugget of exposition about the germ of their animus. The revelation that the Red Queen felt the need to behead her kingly husband passes quickly and without elaboration, much like the emotional undercurrent to her relationship with the head of her Army, the Knave of Hearts (Crispin Glover! ).